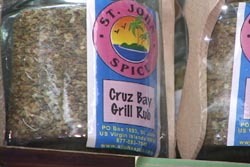 Thanks for the piece on STJ Spice. My wife, Marcia, and I have known Ruth and Ron for years and they are great people. We actually have seen Ron without his hat…yup, true story…ask Ruth. By the way, I use a MacBook and was able to view the video by downloading Quicktime. We followed the Bongo blog religiously and really enjoy the new site. Thank you. I loved the video and I’m really enjoying the new website. You gotta love that Ruth and yes I am a Blind Betty Junckie. Thanks again guys! I heart Ruth and Ron! We spent a great night with them at Sunday Jazz at the Beach Bar. Ruth’s a special person and Ron packs a mean box for shipping! I’m also loving your new website! Keep up the great work! We love your new website. Great interview with Ruth–and right on with the Cafe Roma comments. Cafe Roma is a terrific ITALIAN restaurant. It was the first restaurant I ever ate at-on my first night-on my first trip to St.John in 1987! That was a lot of fun. I can smell the store if I close my eyes. In August, we were in the store every day and it was a lot of fun meeting Ruth and getting to know her a little bit . Really fun video. Felt like I was watching 60 minutes or something. Extremely professional. I’ve enjoyed the Bongo blog since the beginning and this new site is even better. Thanks you guys! Thanks for the great interview. It’s nice to see the locals. Ruth is right, St. John is always on our minds! Can’t wait to go back in July! Thank you also for the great new website. Great job! It was great seeing Ruth and it looks like we’re not the only family in which running out of Cruz Bay Grill Rub is grounds for divorce.